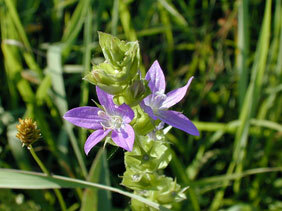 Triodanis perfoliata (L. ) Nieuw. Also Called: Clasping venus' looking-glass. Stems: Erect, slender, mostly 5-angled, simple or branched from bases, densely leafy, somewhat hairy. Leaves: Alternate, simple, clasping, heart-shaped to broadly ovate, 1/4 to 1 inch long, 1/3 to 1 inch wide, glabrous above, rough-hairy below; margins round toothed or pointed toothed; tips broadly pointed to rounded. Inflorescences: 1-3 flowers sessile in leaf axil; bracts heart-shaped to broadly ovate. Flowers: Calyx lobes narrowly triangular; flowers of 2 forms; upper flowers open at pollination, circular in outline, 1/2 to 1 inch wide; corollas purple to blue, sometimes with white streaks; petals 5, united at bases; lower flowers small, closed, self-pollinating; corollas purple to blue. Fruits: Capsules, egg-shaped, 1/4 inch long; seeds numerous, brown. Habitat: Dry sandy or gravelly prairies, pastures, waste ground, and occasionally woodlands. Distribution: Throughout except extreme west of Kansas.